This production opened on February 28, 2015 and closed on March 8, 2015. Back by popular demand! This version of the hilarious classic is using official Revised script (published 13 years after the original script, which was used last time) and the traditional three-person cast. So it’s the same and yet completely different! If you saw the original, you’ll enjoy this even more. If you didn’t see the original, you now have a chance to fill that gaping hole in your life! This “Dessert” Theatre will be held at the Coventry Senior Center on 50 Wood St, Coventry, RI 02816; (Google Maps) on February 28 (7pm), March 1 (2pm), March 7 (7pm) and March 8 (2pm) 2015. Tickets are $20 per person including all-you-can-eat desserts, coffee, tea, etc. or $12 for the show only (desserts can be purchases à la carte). 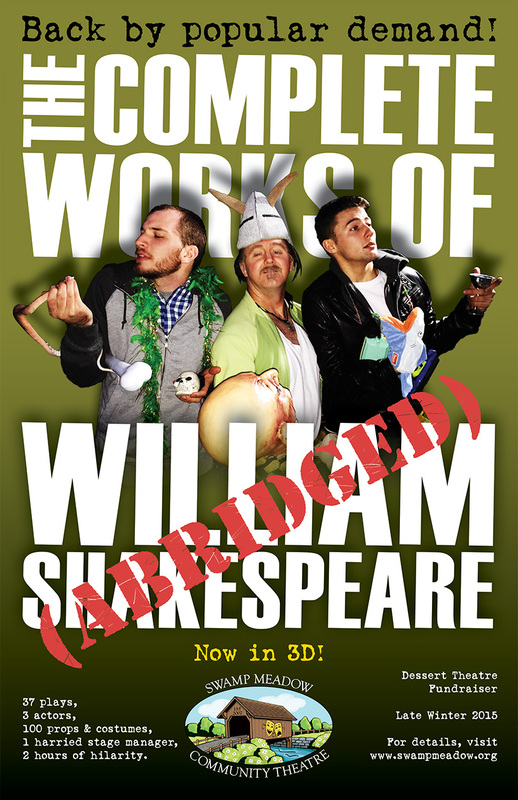 Come see The Complete Works of William Shakespeare (Abridged) [Revised] (Again)!